Wargaming has announced that the mobile spin-off of its online naval combat game, World of Warships Blitz is set to launch on the 18th of January. “As a mobile game, World of Warships Blitz is casual, easy to learn and super competitive,” said Thaine Lyman, Head of Shooters at Wargaming Mobile. Developed in partnership with KingNet, World of Warships Blitz will let players battle one another using a massive roster of 90 legendary warships from Japan, USA, Germany and the USSR. 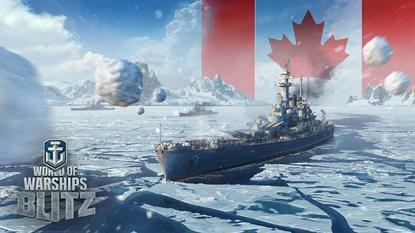 Choosing between four distinct classes of ship (agile destroyers, well-rounded cruisers, powerful heavy battleships and long-range tactical aircraft carriers), players will be able to take to the seas in rapid 7-vs-7 player battles, team up with friends, unlock new ships, and take part in exciting single player missions. The game will be available on both Apple's App Store and the Google Play Store, with the game even supporting cross-platform multiplayer. Both iOS and Android players can pre-register here, starting December 23 to receive the Aurora Premium ship when the game launches.